The Service Module of Microsoft Dynamics NAV supports equipment manufacturing and other service-savvy companies in planning their service orders. Usually, long-term recurring maintenance contracts are also part of service orders. Due to their precise knowledge of the customers’ specific requirements, many service technicians mostly serve the same customers. This is why NAV allows to allocate a „preferred resource“ to a Service Item. Read in this blog post how visualizing the service data in NAV simplifies allocating the preferred technician to the Service Item Line and helps the dispatcher to gain more agility. The Visual Service Scheduler (VSS) visualizes the data of the Service Module and of the resources in Microsoft Dynamics NAV in an interactive Gantt chart. Not allocated service orders are shown in a Tree View and can simply be allocated by drag & drop. The resource of first choice is indicated by a star symbol in the overview so that the dispatcher recognizes it immediately. All he has to do now is to drag the order to the desired position in the Gantt chart. Saving the data will directly write them back to NAV. Different combinations of skills and indicating the preferred resource are possible where the resources to be allocated are concerned. The Visual Service Scheduler’s great advantage lies in visualizing all these data simultaneously by symbols, thus offering the dispatcher valuable decision support. 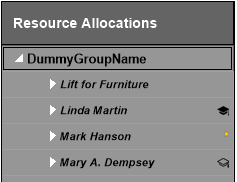 The example above shows Mark as preferred technician while Linda has all required skills and Mary’s skills at least in part correspond with those needed. If Mark gets ill, e.g., the VSS shows the dispatcher that Linda will be the best replacement candidate for this service order. In case Linda’s capacities are utilized by other tasks in the required period, Mary could be an alternative. Want to know more about the Visual Service Scheduler? Schedule a demo.